A princely state, also called native state (legally, under the British) or Indian state (for those states on the subcontinent), was a nominally sovereign monarchy under a local or regional ruler in a subsidiary alliance with a greater power. 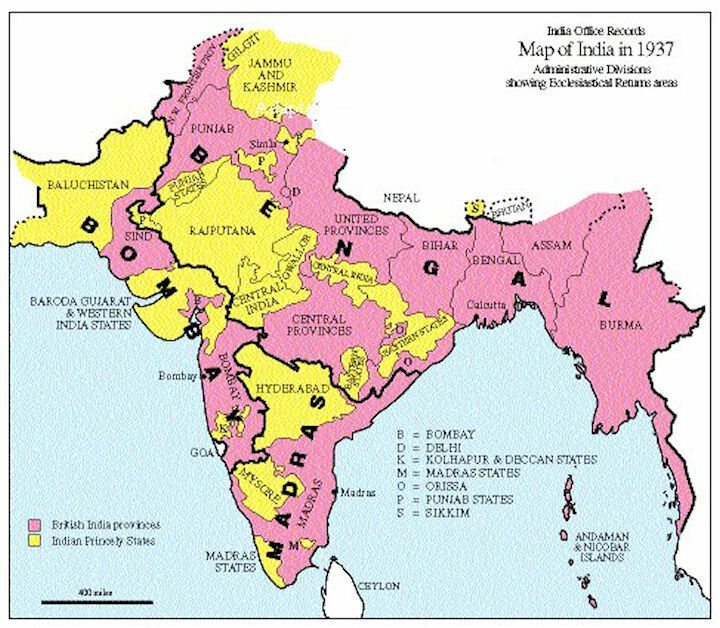 The British ruled India with two administrative systems: British Provinces and Indian "princely" states; about 60% of the territory of the Indian sub-continent were provinces and 40% were princely states. Though the history of the princely states of the subcontinent dates from at least the classical period of Indian history, the predominant usage of the term princely state specifically refers to a semi-sovereign principality on the Indian subcontinent during the British Raj that was not directly governed by the British, but rather by a local ruler under a form of indirect rule. In principle, the princely states had internal autonomy, while by treaty the British Crown had suzerainty and was responsible for the states' external affairs. In practice, while the states were indeed ruled by potentates with a variety of titles, such as Chhatrapati, Maharaja, Raja, Raje, Deshmukh, Nawab, Baig, Khan, Nizam,Mirza or specially Jam for Jadeja/Samma. The princely States recognised the paramountcy of the British Crown. The functions of paramountcy were exercised through the Crown Representative, who was also the Governor General of India and whose functions relating to the relations of the British Crown with the Rulers of all princely states remained distinct. A separate machinery as well as procedure were evolved for the exercise of these functions. From 1920, the states were represented in the Chamber of Princes, which held its meetings in New Delhi. The most important states were ranked among the salute states. Before the Partition of India in 1947, multiple Rajput and non-Rajput Princely States existed in India which were not part of British India. These were the parts of the Indian subcontinent which had not been conquered or annexed by the British but were subject to subsidiary alliances. There were more than 565 states of various sorts when Britain granted the Indian independence 15 August 1947. About 210 are commonly listed as "states", ruled by potentates with a variety of titles, such as Raja, Maharaja, Nawab, Khan or Nizam. The rest were "estates" (jagir), "estate revenue grants" (thikana), and "land holders" (zamindar), with jagirdars, thakurs, or zamindarsno of gretarer or lesser prominence and title. Only 21 had actual state governments, and only three were large (Mysore, Hyderabad and Kashmir). The vast majority of the Indian states were not entitled to gun-salutes. These were mainly smaller geographical units, some little more than a few square miles. They may have been acquired by conquest or owed allegiance to some larger regional power at some previous time in history. The powers enjoyed by the rulers of these states were usually more limited than those of the salute states and they were not entitled to the hereditary style of Highness. The Indian Independence Act 1947, the British gave up their suzerainty of the states and each was left free to choose to join India or Pakistan. Some of the rulers explored the possibility of a federation of the states separate from either, but this came to nothing. Most of the states decided to accede to India or Pakistan. Others which held out for independence were later invaded by India: Junagadh (1947-1948), Hyderabad on 18 September 1948, Bilaspur on 12 October 1948, and Bhopal on 1 May 1949. The Dewan of Travancore chose to remain an independent country. Subsequently in 1948 the merger in the Union of India took place and the area of the States formed a constituent part of newly organised State. They were absorbed into the two new independent countries in 1947-49. The absorption process was peaceful except in Kashmir (bitterly divided between India and Pakistan) and Hyderabad. By the end of 1949, all of the states except Sikkim had chosen to accede to one of the newly independent states of India or Pakistan or else had been annexed. All the princes were eventually pensioned off. After the attainment of Independence, the Central Government at Delhi resolved to settle the future of the numerous Indian Princely States, including those of ancient land of Malwa, subsequently better known as Central India. Heads of States and Estates were called at Delhi in April 1948. In the Conference a decision was taken that the 25 States and Estates of Western Central India should form a Union to be called Madhya Bharat. It was also agreed by all that the existing rulers of the States of Gwalior and Indore, would hold the posts of Rajpramukh and Senior Up Rajpramukh, respectively, of this newly formed State during their life time. It was also decided that in exercising their functions they will be assisted and advised by a Council of Ministers. The Convention was signed by all the heads of the States and Estates on 22nd April, 1948. When the Delimitation of Parliamentary and Assembly Constituencies (Madhya Bharat) Order of 1951 was passed, the States were, for the first time, divided into Parliamentary constituencies. In India, a Salute state was a princely state (i.e. reigned by a native ruler of princely rank) which the British colonial paramount ruler has granted a gun salute; i.e., the proto-collary privilege for its ruler to be greeted - originally by Royal Navy ships, later also on land - with a number of gun shots, as recognition of the state's relative status. For the British in India, the ceremonial (and political) structure within which the princes were placed was determined by the number of ceremonial "guns" each ruler was allowed in his (or, rarely, her) formal salute. In ways that went far beyond the counting of the number of cannon-shots which honored the ruler, the number of "guns" served to structure the entire political system of India's external and internal foreign relations. The "Gun System" was the true backbone of the heirarchy of states. These states -- and this is rather of a "maximal listing" -- are listed according to their 1912 salutes, which date before the massive restructurings of WWI. There was great flux in such matters. Moreover, this list ignores "personal salutes" and tries to work consistently within the framework of the "statutory" salutes. Being an official reception of the native chiefs, a Durbar is the great function which symbolises to Indians the power and magnificence of the Viceregal position. The manner of the reception varies according to rank. The etiquette on such occasions is necessarily very strict. No eight-gun prince may have nine guns in his honor; no fifteen-gun Maharajah may precede a nineteen-gun Maharajah. Every one took precedence according to rank. Perhaps the most imposing function that has ever taken place was the Imperial Assemblage on New Year's Day, 1877, during the Viceroyalty of Lord Lytton, when the Queen was proclaimed Empress of India. Delhi, the capital of the Mogul dynasty, and the city which natives and Europeans alike associate most closely with the idea of the Indian Empire, was appropriately chosen for this historic scene. The plain of Delhi was converted for the occasion into an immense canvas city, covering some seven or eight miles, in the midst of which stood the Viceregal camp and the private encampments of the princes and chiefs of India. The year 1902 drew to a close, and Delhi was swarming thrice its common size in preparation for the Great Durbar, whereat the accession of the first English Emperor of India was to be proclaimed. Northward, beyond the historic Ridge, a new and an even more wonderful Delhi had sprung up in the course of weeks; a Delhi of ten thousand tents, with more than thirty miles of streets between them; a city that it would take a man seven or eight hours of continuous smart marching to walk round. For weeks the tramp of elephants and horses had filled the air day by day, and had rarely ceased at night. The camps of the native princes lay in carefully planned order. The comings and goings of the princes themselves - emulous, proud, jealous in trifles - were announced punctiliously by the proper number of guns, from twenty-one downward, the envied and eagerly sought salute that grades Indian princes by absolute mathematical scale. A nine-gun salute placed a Rajah merely in the seventh grade, with the eleven-gun, the thirteen-gun, the fifteen-gun, the seventeen- gun and the nineteen-gun degrees between it and the topmost rank of twenty-one guns, reserved for the three greatest native princes of all India.